Welcome! This morning I am excited to be sharing a couple of cards made with my sweet friend Betsy Veldman's The Greetery stamps, dies, and stencils. I've admired both Betsy's work and her character for years, and I wish her the greatest success in her new venture! Betsy sent me two stamp sets, along with coordinating dies and stencils--Hand in Hand, and Fir & Foliage. Shown above is a list of the Copic markers that I used to color the Hand and Heart images and to airbrush the path, grass, and sky. I used a scrap of terrycloth spritzed with Copic Colorless Blender solution to get texture on the airbrushed stone pathway. Also, I fussy-cut around the lady's hand and lower left forearm so that she was holding hands more obviously with her husband. 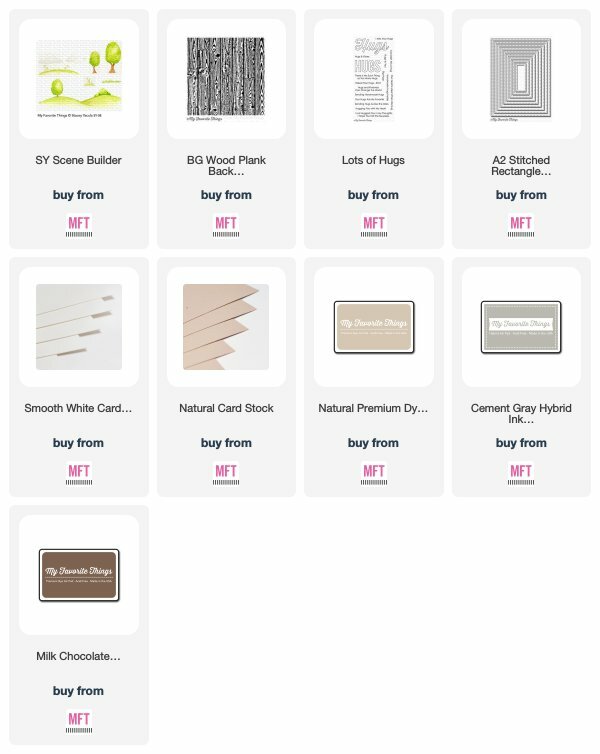 The Greetery's storefront will go live on Friday, April 26, at 10am Eastern time. At this time, you will be able to find ALL of the products that Betsy introduces this week. Be sure to check her Greetery blog every day to see who is sharing her new sets for that day--I've watched the sneak peeks, and I know that they'll be awesome! Welcome! Today I have a second card and coloring video to share, using the April 2019 Club La-La Land Crafts Kit. For this one, I used the Poodles of Love stamp set, along with the Paris die (April Kit) and LLLC's Stitched Elements Die. For patterned papers, I found some perfect digital scrapbooking papers and printed them out at 50% (6" x 6")--Samantha Walker's More Paris Girl Pink and Black and More Paris Girl Pink and Gray. Shown above are the Copic Sketch markers that I used to color the Poodles of Love images. will go through April 19. Here's a picture of the FULL kit--two stamp sets and three dies. Of course, if you prefer just stamp sets of just dies, you can subscribe to that option as well. I explained the club part pretty thoroughly yesterday, so i think I'll just link you to the April 2019 Club LLLC kit page to learn more if you'd like. post are affiliate links. Thanks! Club La-La Land Crafts April Release: Paris, Anyone? Shown above are the Copic markers that I used to color the Marci in Paris and Poodles of Love images. Patterned papers are from the Carta Bella It's a Girl 6" x 6" paper pad. And HERE is a direct link to my preview of the April kit video: https://youtu.be/tsvyE0Iu6Ac It's not just about opening a package--I tossed some helpful tidbits in, I hope! Sign Up for the April 2019 Kit shown above will go through April 19. You can find out more about the April Club La-La Land Kit HERE. Fair warning--the kit is on a subscription basis, and it's available for a very limited time--through April 19. Occasionally kit images may rotate into the regular LLLC stamp line six months to a year later, according to the website. But if you think you love it, that date is April 19. Again, I will have one more April kit post tomorrow, along with a coloring video for the poodles in the Poodles of Love stamp set. Please note that the Club La-La Land Kit links that I have used here are affiliate links. Thanks! Welcome back! 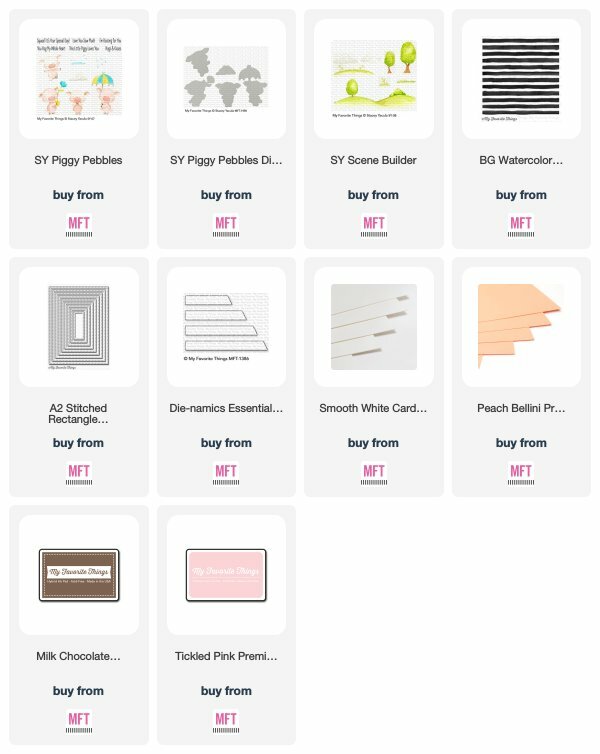 It's April release day for My Favorite Things Stamps; all of the lovely stamp sets and dies atet you've been seeing over the past five days are now available. I couldn't resist revisiting the Piggy Pebbles and the Scene Builder stamp sets, along with that fabulous Window Die-namics. This time, however, I put the scene on the inside of my card to give it more depth and make it a true window. Shown above are the Copic Sketch markers that I used to color the Piggy Pebbles and Scene Builder images. Love to Bake Marci: Two Cards and a Coloring Video! My first card features Love to Bake Marci, along with one of her three Baking Hamster sidekicks. I colored Marci's hair and skin on the video below, and I paper-pieced her clothing. Yes, I sped it up--it's only ten minutes long. It would have been almost forty minutes long otherwise, and nobody wants to watch me color for forty minutes! Shown above are the Copic Sketch markers that I used to color the Love to Bake Marci and Baking Hamsters images. Patterned papers are from the Echo Park Petticoats & Pinstripes 6" x 6" paper pad. Next I have a card featuring the cupcake/muffin die in the March kit; I designed my card around the sentiment that's on the inside of my card, "You are a cupcake in a world full of muffins." I loved that sentiment and knew that I wanted one cupcake and several muffins. (It's simple to make cupcakes vs. muffins: with your muffin, tuck the top inside the wrapper, and with the cupcake, leave the top on the outside of the cupcake wrapper.) I added a bit of Glossy Accents to my little strawberry on top of the cupcake, as well as glitter on the frosting. I think that you could also use the muffin configuration to make chocolates--you know, the ones that come in paper wrappers like a Whitman's Sampler. . . Patterned paper for this card is digital, printed on a color laser printer at 50% scale, Carta Bella Homemade with Love Paper Pack 2. Again, check THIS PAGE for more about the Club La-La Land Crafts Monthly Kits. Please note that an affiliate link IS used in this post. Shown above are the Copic Sketch markers that I used to color the Scene Builder images. I kept it pretty light in value overall, going for a peaceful, light, and dreamy farm look. 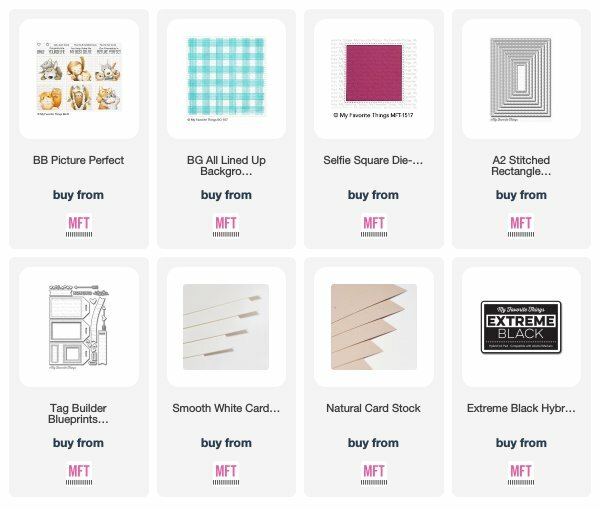 In addition to the ones that I've shared here, there are more fabulous new products being showcased today; I hope you get a chance to visit the MFT Stamps Blog for a complete list of designers playing along with today's new products AND to enter for prizes! 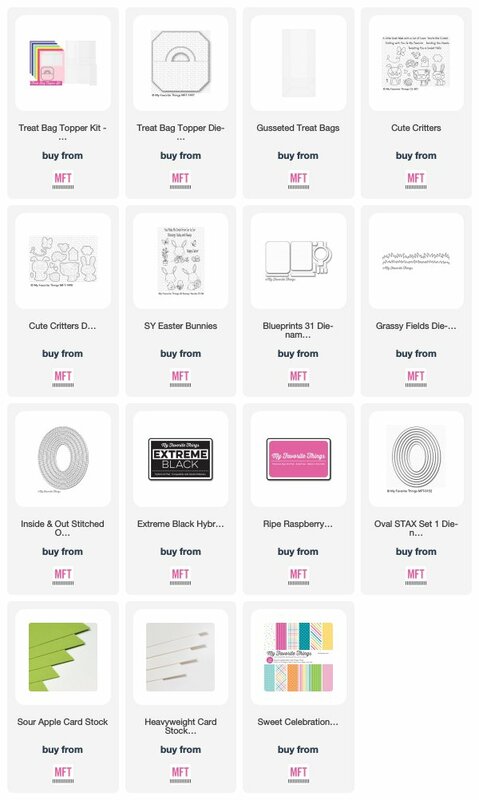 Remember that while all MFT products that I used are linked below, the NEW product links won't be live until release time--that's Tuesday morning (April 9) at 10am Eastern time. All other links should work now. Thank you for stopping by today! Welcome to Countdown Day 3 of the My Favorite Things Stamps April Release countdown! 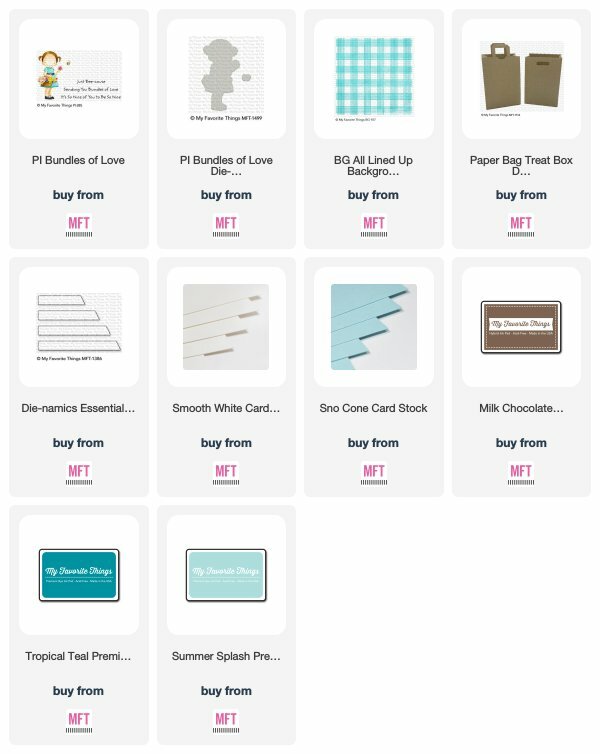 Today I chose the Bundles of Love Pure Innocence image, pairing it with the Paper Bag Treat Box and the All Lined Up Background. Shown above are the Copic Sketch markers that I used to color the Bundles of Love images. How about that sweet little paper bag? I loved the realistic details of the handle, the sawtooth top, and the little notch in the front of the bag! I could have put candy in it, but we've already mailed all that we had in the house to our college student. So I thought that this would also work for a gift card. 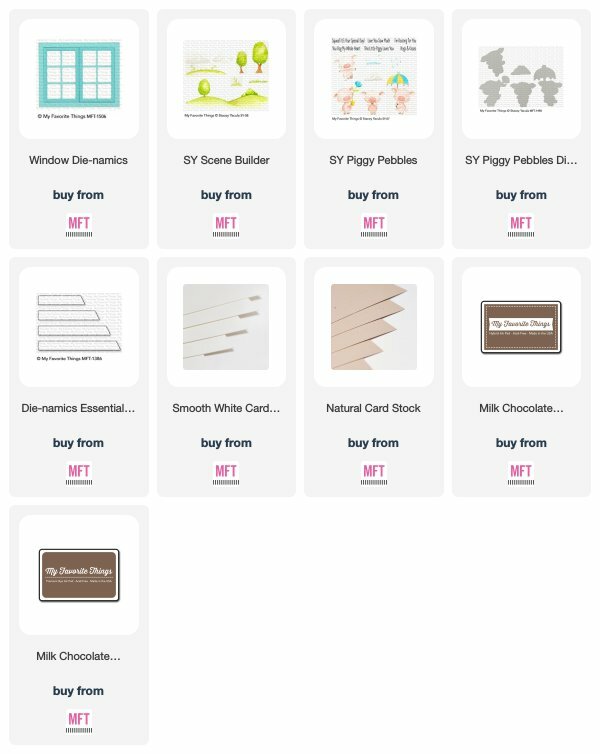 Welcome to Day 4 of the My Favorite Things Stamps April Release Countdown! Today's card feature Piggy Pebbles and the Scene Builder stamp set--both darling Stacey Yacula sets. Welcome to Day 5 of the My Favorite Things Stamps April Release Countdown! I chose the cat-friends image from the HUGE Picture Perfect stamp set--I loved this set's size, which made it easy to color! (Okay, my eyes aren't as young as they used to be.) This image reminded me of my parents' last litter of kittens; one kitten would play the big BAD guy, and his littermates would act scared when he showed off. Shown here are the Copic markers that I used to color the Picture Perfect image. Welcome! 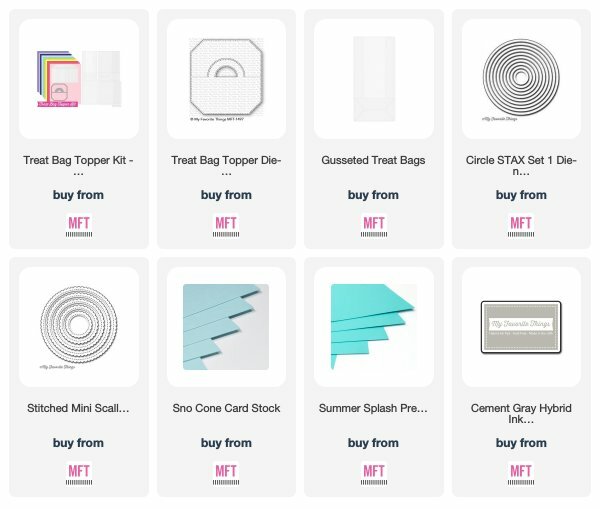 It's release day for the My Favorite Things Stamps Treat Bag Topper Kit! I chose the Stacey Yacula Easter Bunnies stamp set to pair with my Treat Bag Topper today, because I loved it with the white chocolate Easter bunny that I found for my intended recipient. Shown above are the Copic Sketch markers that I used to color the Easter Bunnies image. I stamped the bunny in MFT's Cement Gray Hybrid ink for a no-lines look. Welcome! I have a second My Favorite Things Stamps Treat Bag Topper Kit project to share today. How about another little Easter treat? I thought that the bunny Peeps would be perfect with the Cute Critters bunny! Shown above are the Copic Sketch markers that I used to color the Cute Critters images. Patterned paper is from the Sweet Celebration paper pack. While the stamped images are from Cute Critters, the sentiment on the tag is from the Stacey Yacula Easter Bunnies stamp set--I needed one small enough to fit on a tag.